Reputation: There is one species of bee. Bees are yellow and black. Bees dance. Bees make honey. Bees die when they sting you. Reality: There are around 20,000 species, only one of which is the common honeybee. They come in many colours. Most bees don't dance. Only a few species make honey. For most bees, stinging does not mean death. Some never sting. Everyone loves the honeybee. We humans have been drooling over its honey and prospering from its powers of pollination for millennia. But our worship of this one species, understandable as it might be, is a sign that something has gone wrong. It's the perfect example of our ruthlessly human-centric, overtly practical view of the natural world. 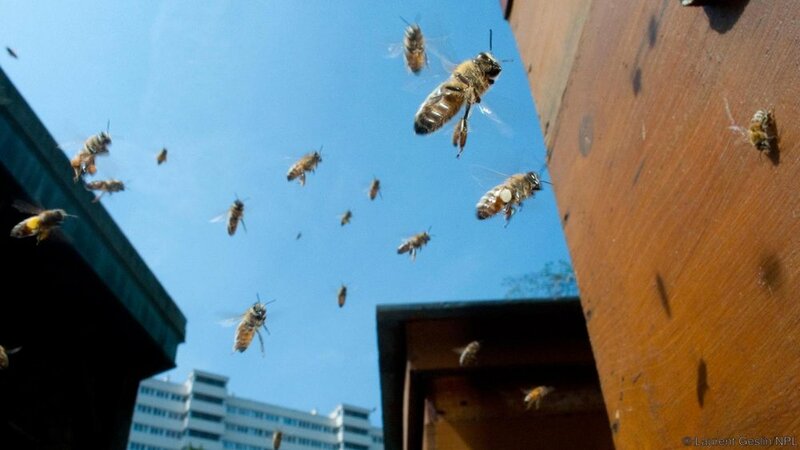 There are actually around 20,000 known species of bee. The famous European honeybee Apis mellifera is just one of them. They come in a wide range of sizes. Members of the teensy Australian genus Euryglossina (Quasihesma) are typically less than 2mm long, while the alarmingly large Megachile/Chalicodoma pluto from Indonesia is almost 4cm. There are also plenty of bees that don't conform to the popular perception of yellow and black. The North American sweat bee Agapostemon splendens, for instance, is green and blue. Among the valley carpenter bees (Xylocopa varipuncta) of North America, the females are black and the males are yellow. The European honeybee is by far and away the most prolific maker of honey. But there are around half a dozen other honeybees in south Asia that are similarly exploited. Being social, all these honey-making species have evolved ways to communicate important information to the rest of the hive. Different species appear to have their own distinct "dialects" of waggle dance. But bees are so smart that when researchers coaxed Asiatic and European bees to inhabit the same hive, the Asiatic bees were able to translate the dancing language of the Europeans. Sophisticated as the waggle dance undoubtedly is, bees of all shapes and sizes perform other feats of communication too. When a bee is foraging, it leaves behind volatile chemicals that act like sticky notes: smelly messages that reveal whether a flower has been recently plundered. Subsequent visitors use these cues to improve their foraging efficiency. On the subject of stinging, there are quite a few misconceptions. For a start, it's only females that can sting. That's because the stinger is a modified version of their egg-laying organ, the ovipositor. "No male bee of any species can sting, even honeybees and bumblebees," says Richard Comont of the Bumblebee Conservation Trust in the UK. Then there's the widespread belief that all bees have barbed stingers that lodge in the target's skin, eviscerating the bee and killing it. It's only honeybee workers that do this. Most bee species have barbless stingers, so can attack with impunity. That said, most species don't do much stinging. This is the case for most solitary bees, which make up around half of all known bee species. Among solitary bees, all females are fertile, unlike social bees with their legions of sterile workers. That means a risky strategy like stinging is only deployed in the most extreme situations. "It's far better for them to flee and fight another day," says Comont. There are also a lot of bees – around 500 species – whose stingers are so reduced that they are collectively referred to as stingless bees. These sound nice, though there are a few species of stingless bees that have given up nectar and pollen in favour of rotting flesh. These so-called vulture bees aside, most bees are united by their power to pollinate. The value of this service to agriculture is huge, estimated at US$70 billion every year. This explains why there is such concern over the disappearance of bees in recent decades. The decline in apiculture had resulted in a decline in honeybees. "For wild bees, it's a bit of a mixed and incomplete picture," says Comont. "But the UK lost 18 species of solitary bee and two species of bumblebee in the 20th century." The relationship between bees and flowers goes way back: the flourishing of flowering plants that occurred over 100 million years ago is almost certainly bound up with the buzzing of bees. The intensification of agriculture has disrupted that relationship. "We've been systematically stripping flowers out of the countryside," says Comont. "The best way to reverse these declines is to put flowers back." Older PostWHAT IS BIODIVERSITY AND WHY PROTECT IT?